The crews working for Junk King Fort Lauderdale have a lot of experience lifting and loading all kinds of objects. They’ve moved mattresses, futons, pianos and even hot tubs. They know what it takes to get something heavy out of the house without scratching floors. They’ll treat your home with the same amount of respect that they treat their own property. 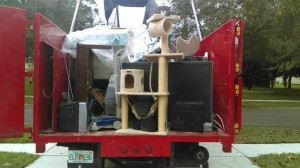 One of the added benefits of hiring Junk King Fort Lauderdale is that the stuff you’re getting rid of will be going to waste. All the furniture, clothing and household goods can be donated to charities. That should make you feel good about clearing out your clutter! That’s a great breakdown of how junk King operates. Don’t live with your junk for one more hour. Give it all to Junk King Fort Lauderdale today. You’ll be glad you did. This entry was posted in Fort Lauderdale Junk Removal and tagged Junk King, junk removal, reviews on September 30, 2017 by Junk King. Last updated October 1, 2017 .